History of PDF files: The PDF file was originally developed by Adobe in the early 1990’s. There was a main motive of Adobe to create it. They wanted to make a kind of soft document which cannot be edited, modified or reconstructed. Hence, it was aimed to protect the privacy of salient documents. Adobe was over the beyond successful in creating it, since editing a PDF file was next to impossible. The time ran over but the peculiar property of PDF file remained intact. The popularity of PDF files grew on a large scale with the interval of time. It was being used in offices, schools, colleges, military, renowned organisations and special institutes. Now, there are over 15 hundred million pdf files on internet and increasing each day. You can also search for all the PDF files on Google by just typing “filetype:pdf” as shown in the below image. Also Read: Undo sent email in Gmail | Stop accidentally sent message in Gmail. It can exchange all sorts of documents like presentations, notices, invoices, CAD drawings and also legal forms. PDF files are normally petite i.e. smaller in size as compared to its original content. The most important property of a PDF file is it cannot be edited easily. The original formatting of the document remains preserved. This is the main reason that the people prefer using it. Though, it becomes problem to the second person. Virus cannot attack PDF files. Since, it can not be edited, thus, virus cannot attack it. So, probability of losing data from PDF file is quite negligible. The user can also prevent it from printing or copying text. In such cases, PDF file is the best choice. A PDF file is compatible in all sorts of Operating system whether it is windows, android, MAC, Symbian etc. The software called Adobe Reader allows you to read the PDF documents without any problem. Browsers like Google Chrome does not need any special plugins to read it. Hence, it is used widely on internet. Also Read: How to increase copying speed in Windows XP/Vista/7/8. Over the ages, the question remains the same… How to edit PDF files? Many software developers and hackers researched to find the method that can help them edit PDF files. Many were disappointed in doing so while many got success. Nowadays, there are many methods in which one can edit pdf files. Some methods are authorized ones, some are clever tricks while some are tools developed by software geeks. 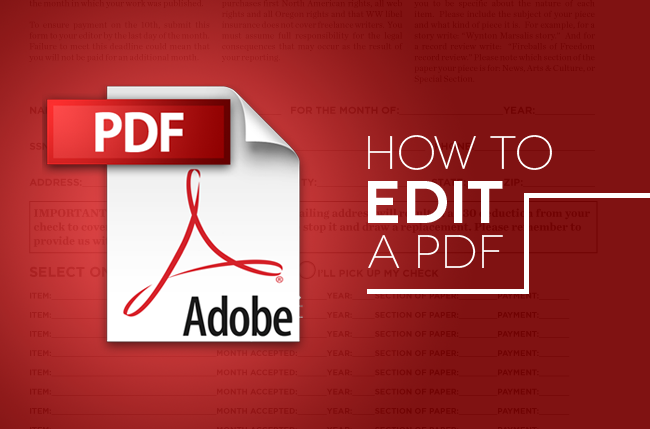 I’m gonna share all the methods in this article that would help you to edit pdf files. Tip: Prefer to make a copy of the original file before editing it. After developing PDF files, Adobe realized the need of a software to edit PDF files for special purposes. They, then launched Adobe Acrobat. Adobe Acrobat is a premium software that can easily edit text of PDF files. There are two plans of Adobe Acrobat that are available to users. $450 for one-time purchase and $50 per month annually. There are many tools available with Adobe Acrobat that initializes modification of PDF files easily. – Browse and edit PDF file you want to edit. 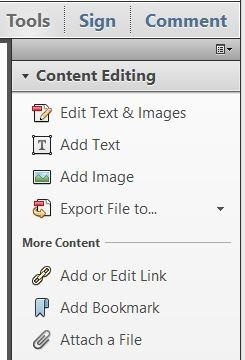 – Click the Tools option from the top right corner followed by Editing Panel. – Select the part of the file you want to edit. There will be many editing content available at the right panel. Utilize it. – When you are done, save it. That’s it. Your desired PDF file will be edited. The Oracle PDF Import extension of OpenOffice Draw is the best free tool to edit PDF files. It can be used to convert any PDF files. It has lots of versatile features. It allows the user to convert images (in the PDF) into vector images, edit PDF objects and edit text from the PDF file. It is available for all major platforms. But, it also has some limitations. It does not support PDF forms, table conversions and decrypted files. If your using Windows platform, you can overcome most of these limitations using a tool called “PDFill“. – Install OpenOffice in your computer. OpenOffice is a complete suite of Office products. Download it from here. – After installing it, run the tool “PDF Import extension”. Download the PDF Import Extension from here. – Now, launch OpenOffice Draw. – Browse the PDF file you want to edit and open it. – Now, edit any text field by double-clicking the text. To add new text, click the Text link at the bottom of the Window, and then click the cursor on where you want to add text. – When you are done, click the PDF link to export the file as a PDF. Many websites allows you to edit pdf files. The sites could only convert the PDF files to word or other editable files. Then, the editing process depends on you. Edit it and then again convert it into PDF files. Though it is not 100% accurate. There will be some errors in the edited file. The fonts, labels or lines may displace or omit in the edited file. Tip: It may take some time to convert a PDF file. So, have patience. Also, the online tools do not convert password protected files. Trick: Convert PDF file to Word or other editable files, edit it and then again convert it to PDF file. Next articleTrick: check if image, picture is edited or photoshopped.